Venture to one of the few remaining frontiers of art and archaeology, and discover a culture weaving together nomadic Berbers, Ancient Romans, Mediaeval Vandals and Umayyads, French colonists and modern Algerians. Begin in Algiers, visiting the extraordinary collection of the National Museum of Antiquities and Islamic Arts, the lively Kasbah and the colonial Cathedral of Our Lady of Africa. 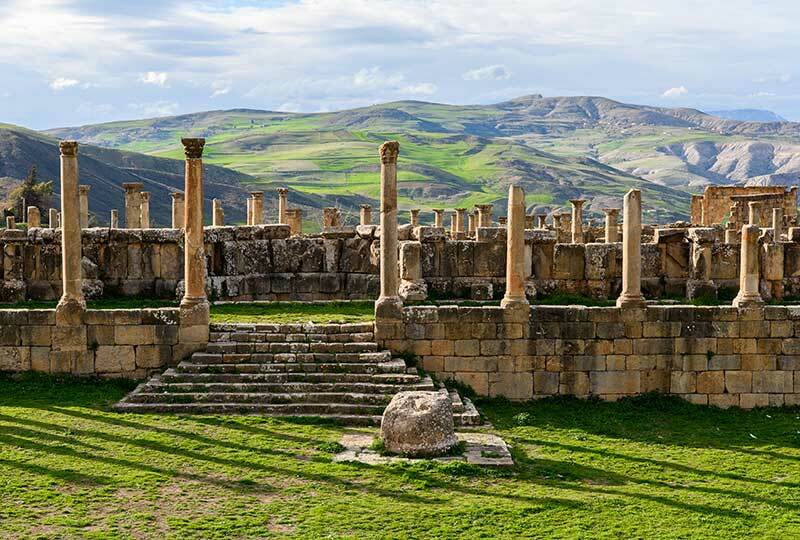 Continue to Sétif and see the stunning 3rd century AD mosaic, the ‘Triumph of Dionysus’, and explore the Roman architectural legacy of temples and triumphal arches in the ancient sites of Djémila and Timgad. Marvel at the city of Constantine, one of the most important power-centres of Roman North Africa, sitting above a deep gorge spanned by multiple bridges. Then, enter the Sahara, visiting the red mudbrick town of Timimoun, where markets and fortresses have grown up around precious sources of water surrounded by the endless desert dunes, and discover the distinctive Mozabite Berber culture in the oasis of Ghardaïa. Note: This tour is designed to connect with Land of Berbers, Carthaginians and Romans: Tunisia with Iain Shearer from 21 October to 3 November 2019. Depart Australia or New Zealand in the afternoon on suggested Qatar Airways flights to Algiers via Doha. Arrive in Algiers in the early afternoon on suggested flights and transfer to the hotel (transfer included in tour price). In the afternoon, attend a welcome briefing and then enjoy a special welcome dinner with Julian and fellow travellers. After a morning talk by Julian, begin your exploration of Algiers on a coach tour of the Upper and Lower Kasbah. The UNESCO World Heritage-listed kasbah contains many mosques, bazaars and traditional dwellings dating from the Ottoman Era in the 17th and 18th centuries. Some were subsequently converted to other uses by the French colonisers, and in the mid-20th century the Kashbah of Algiers was the epicentre of the Algerian liberation movement. 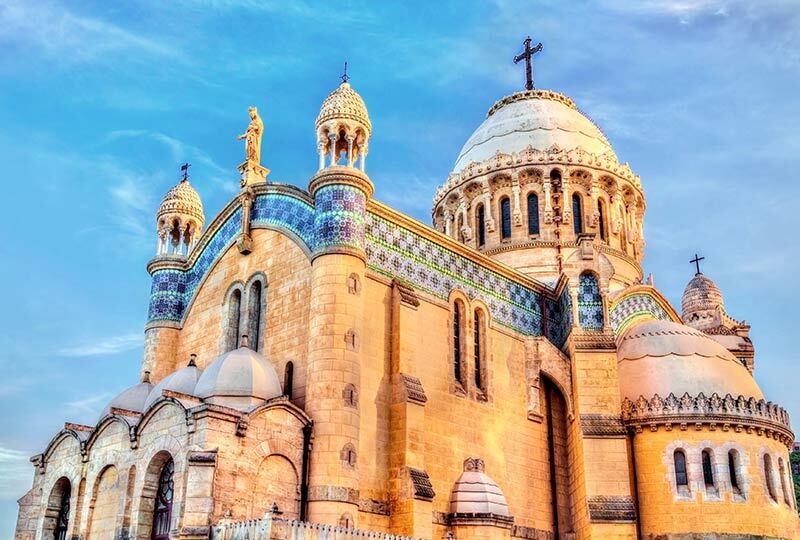 Then visit the Church of Our Lady of Africa, an elegant silver-domed Roman Catholic basilica situated on a high cliff overlooking the Bay of Algiers. Constructed in the late 19th century in the Neo-Byzantine style, the yellow sandstone church includes an Arab-inspired frieze of blue and white mosaic, and a rather ecumenical inscription above the apse: ‘Notre-Dame-d’Afrique, priez pour Nous et pour les Musulmans’ (‘Our Lady of Africa, pray for Us and for the Muslims’). Enjoy lunch at a local restaurant and then visit the National Museum of Antiquities and Islamic Arts, the country’s finest collection of Roman and Algerian artefacts, which relates the story of thousands of years of Algerian culture. Notable pieces include delicately-carved ivory, recovered Roman mosaics and fragments of equestrian bronze statues. 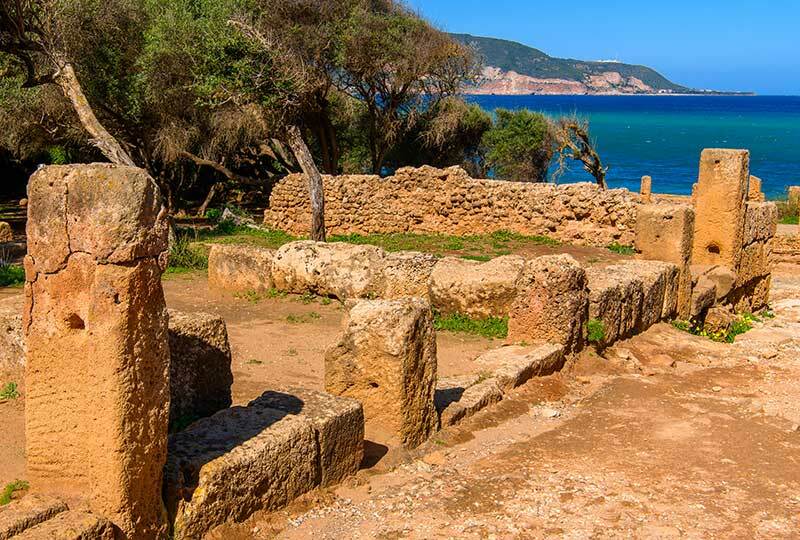 In the morning, visit the Royal Mausoleum of Mauretania in the village of Sidi Rached. The cone-topped circular mausoleum was built in 3 BC by King Juba II of Mauretania for himself and his wife, Cleopatra Selene (the daughter of Marc Anthony and Cleopatra of Egypt). Its construction resembles the famous Mausoleum of Augustus in Rome, which is unsurprising given that Juba was a steadfast ally of Emperor Augustus and was installed as king (first of Numidia, and then of Mauretania) by the grateful emperor. Then continue to the seaside town of Cherchell for lunch, followed by a visit to the Archaeological Museum, which contains some of Africa’s finest Roman mosaics and marble statues, as well as some later Byzantine silverware. Also explore the nearby archaeological site of Tipasa. Originally a small trading colony, when Roman Emperor Claudius decided in the mid-1st century AD to divide the troublesome Kingdom of Mauretania and incorporate it into the Roman Empire as two separate provinces, a military colony was established at Tipasa (east of the capital of one of the provinces, modern Cherchell). Later Byzantine constructions include churches with stunning mosaics – some geometric patterns, some depicting scenes of daily life. Return to Algiers in the late afternoon. Check out of the hotel in the morning and travel to Sétif, enjoying a talk by Julian while en route. 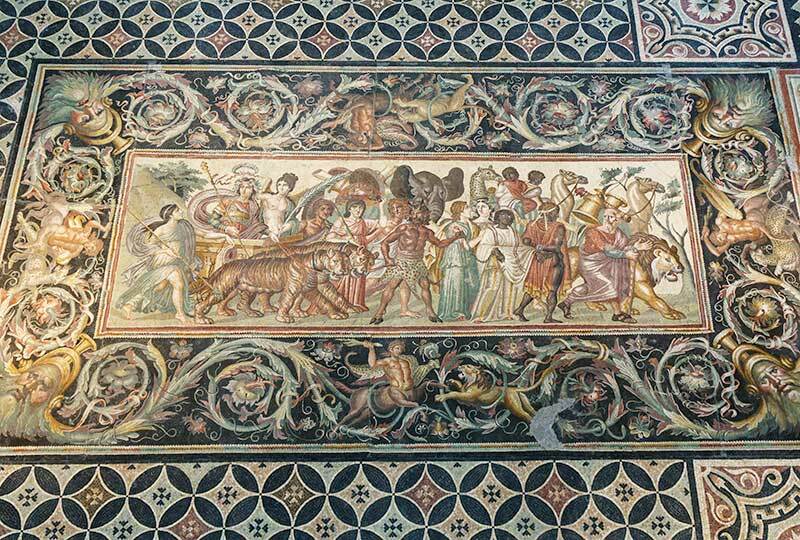 Arrive in Sétif in the early afternoon, and after lunch at a local restaurant, explore the Sétif Archaeological Museum, a repository of some of the country’s finest Roman mosaics. Between depictions of lively battles of centaurs, lions and leopards, the crowning glory of the museum is the magnificent ‘Triumph of Dionysus’, in which the wine god’s chariot is pulled by a pair of fearsome tigers and preceded by a motley crowd of satyrs, lions, elephants, giraffes and camels. Check in to the hotel in the late afternoon. Dinner tonight is at a local restaurant. In the morning, check out of the hotel and visit the archaeological site of Djémila. Inscribed on the UNESCO World Heritage List as a rare exemplar of “Roman town planning adapted to a mountain location”, the ancient city of Cuicul was founded during the reign of the Emperor Nerva in the late 1st century AD at an important strategic site in the mountainous interior of the Roman Province of Numidia. It was adorned with temples, a forum, basilicas and triumphal arches, the remains of which testify to the strength of Roman power in North Africa. It was gradually abandoned as the Roman Empire weakened and contracted in the 5th and 6th centuries AD, and when the Muslims conquered the region in the 8th century, they named the ruined city Djémila (‘beautiful’ in Arabic). Continue to Batna, and check in to the hotel in the evening, followed by dinner. Today, visit the archaeological site of Timgad. Founded as a Roman colony by Emperor Trajan in the early 2nd century AD, ancient Thamugadi is thought to derive its name from the Berber for ‘mountain peaks’, befitting its location of the Aurès Mountains in eastern Algeria. It was created as an entirely new city – not on the site of a previous settlement – and like many a modern planned city it was built according to a perfect orthogonal grid system, still extant some 2,000 years later. 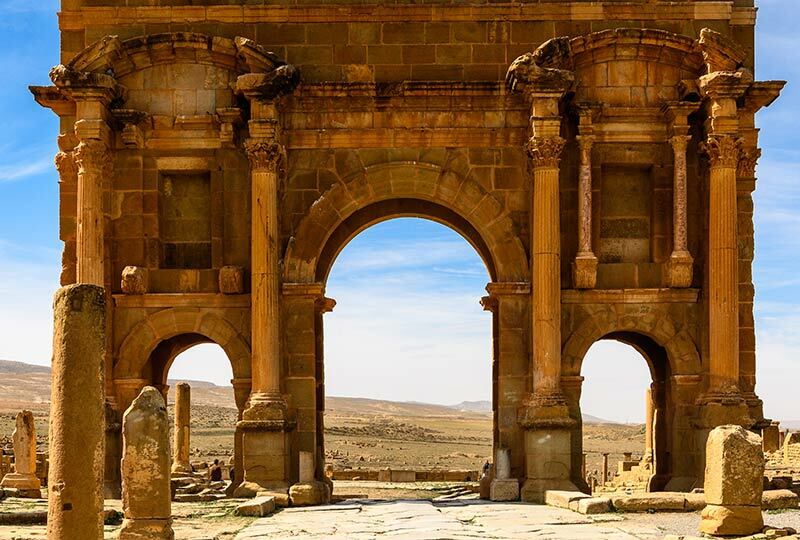 Timgad was embellished with several noteworthy public edifices, including the Library of Timgad, the Capitoline Temple dedicated to Jupiter and the 12-metre tall Arch of Trajan (probably founded by one of Trajan’s successors). In the ensuing centuries, it was augmented with several Christian churches, but, like Djémila, was abandoned after the Muslim conquest in the 8th century. The site of Timgad was gradually covered with sand blown in from the Sahara Desert, accounting for its extraordinary level of preservation. Also see the mosaics of the Timgad Museum, normally only open to archaeologists. Return to Batna in the late afternoon. Check out of the hotel in the morning and visit the ruins of Lambaesis. Like several of the other Roman cities in the region, Lambaesis was founded as a military garrison to pacify the restive Berber tribes of Numidia. Today, the remains of a pair of triumphal arches are still extant, as well as aqueducts, temples and legionary barracks. On the outskirts of the town stretch extensive Roman cemeteries, with many of their headstones still in place. After lunch, continue to the Mauseolum of Medracen. The cone-topped circular structure is reminiscent of the Royal Mausoleum of Mauretania in Tipasa, although on a smaller scale and with a more rudimentary design. Although it was originally thought to have been built in the 2nd century BC for King Micipsa, second ruler of the Kingdom of Numidia, recent archaeological investigations have suggested that it may in fact be up to 200 years older, which would represent considerable architectural sophistication on the part of an as-yet unidentified culture. 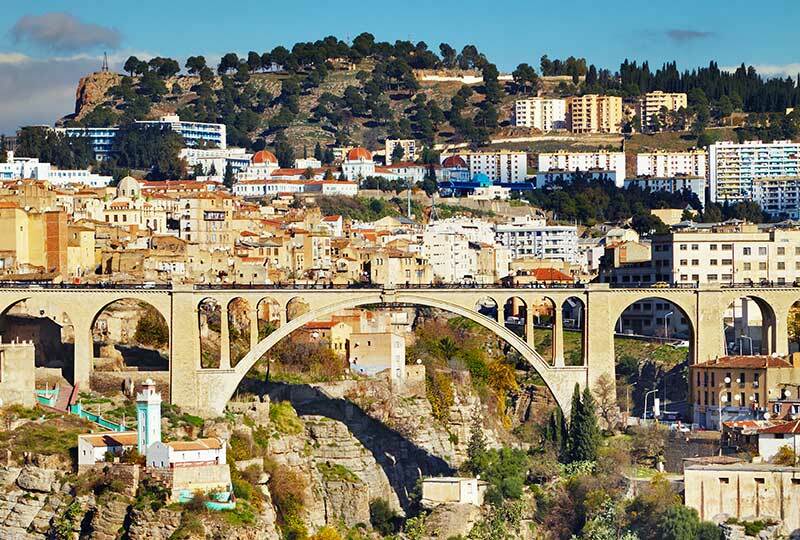 Travel onwards to Constantine and enjoy a talk by Julian on the coming days’ attractions while en route. Arrive in Constantine in the late afternoon, followed by dinner at the hotel. This morning, explore the storied history of the city of Constantine on an orientation coach tour, including the famous ‘Seven Bridges of Constantine’ spanning Rhummel Gorge and the vast Mosque of Emir Abdelkader. Founded as the Phoenician city of Sewa on the heights above a deep ravine, it was later conquered by the Numidian Berbers and, under the name Cirta, was established as the capital of the new Kingdom of Numidia in the 3rd century BC. After the defeat of Numidia by the Roman Empire in 46 BC, Cirta became one of the most important cities of Roman North Africa. Destroyed in the Roman civil wars of the 4th century AD, it was rebuilt by the victor, Emperor Constantine I, and renamed after him. Visit the Palace of Ahmed Bey, built between 1825 and 1835 for the last Ottoman bey (governor) of Constantine. The elegance of the palace, with its marble columns, fountains, engraved cedar doors and courtyard of palms and orange trees, contributed to Constantine being named Arab Capital of Culture in 2015. After lunch at a local restaurant, explore the National Museum of Cirta, which houses a collection of artefacts dating from the Numidian and Roman periods of Constantine and nearby Tiddis. The remainder of the afternoon is at leisure before dinner in the evening. Spend a day exploring Numidian and Roman history, visiting first the archaeological site of Tiddis. Tiddis was a dependent city of Constantine during the Roman period which grew up around a castellum (fortified outpost). As the city developed, its industrial capacity increased with the building of tanneries, and it was adorned with baths and cisterns, a Temple of Saturn and a Sanctuary of Mithras, the remains of which may be seen today. In the afternoon, visit the Mausoleum of Massinissa. Massinissa, one of the most influential figures in Mediterranean politics in the late 3rd century BC, was the leader of the Eastern Berbers during the protracted Second Punic War between Rome and Carthage. Cunningly switching his tribe’s alliance from the Carthaginians to the Romans part-way through the war, Massinissa managed to conquer the Western Berber tribe (who had themselves switched their alliance to Carthage). After the eventual Roman victory in the war, he welded the two halves of Berber territory together as the new Kingdom of Numidia, attempting to settle the hitherto nomadic Berbers and emulate Carthaginian agricultural techniques. Remaining a steadfast ally of Rome, Massinissa died in the early stages of the Third Punic War, and his mausoleum, a spare but elegantly-designed sandstone construction, is a modest monument to a great historical figure. Return to Constantine in the late afternoon. Check out of the hotel in the morning and transfer to Constantine Airport for a flight to Oran (flight included in tour price). On arrival in Oran, transfer to the city of Tlemcen, historic capital of the Berber Kingdom of Tlemcen in the 13th to 16th centuries and a major centre of Ottoman power from the 16th to mid-19th centuries. 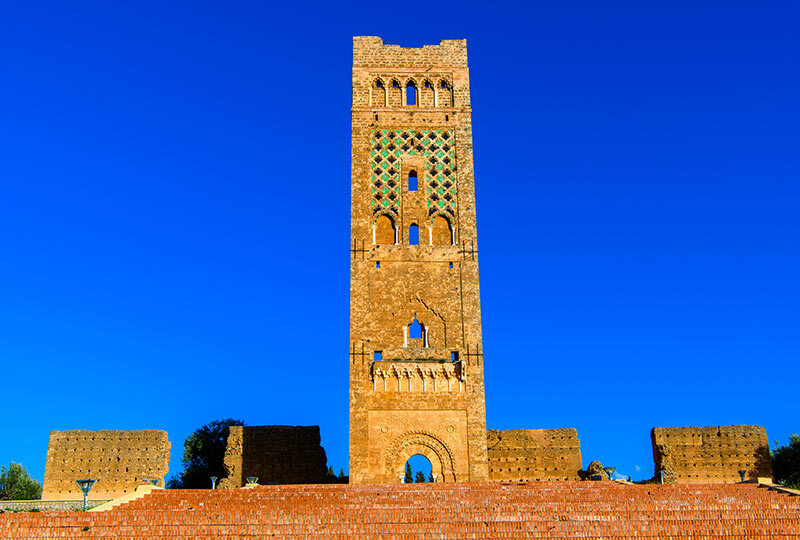 En route, enjoy a talk by Julian, and before entering Tlemcen, make a brief stop at Lalla Setti Plateau to gaze over the city spread out on the plain below. Check in to the hotel in the afternoon. Dinner tonight is at a local restaurant. Spend a day exploring the ancient and Mediaeval history of Tlemcen. Begin the day with a walking tour of the city itself, starting with a visit to the Great Mosque of Tlemcen. Begun in 1082 AD, the Great Mosque is one of the country’s most significant extant examples of architecture dating from the Almoravid Dynasty, a powerful emirate which ruled most of modern Morocco, Spanish Andalusia and northern Algeria in the 11th and 12th centuries. Continue to Sidi Bellahsen Mosque, now a museum, which was founded in 1296 during the Zayyanid Dynasty which ruled the Kingdom of Tlemcen. Also see El Mechouar Palace, official residence of the Kings of Tlemcen between the 13th and 16th centuries. After lunch, visit the archaeological site of Mansourah. The ruins of a mosque and fortified city recall the history of a city originally founded in 1303 by the Marinid Dynasty of Morocco to lay siege to the Kingdom of Tlemcen, but which later became a significant urban centre in its own right. Check out of the hotel in the morning and transfer to Oran Airport for a flight to Timimoun (flight included in tour price). Arrive in Timimoun in the afternoon and transfer to the hotel for check-in. 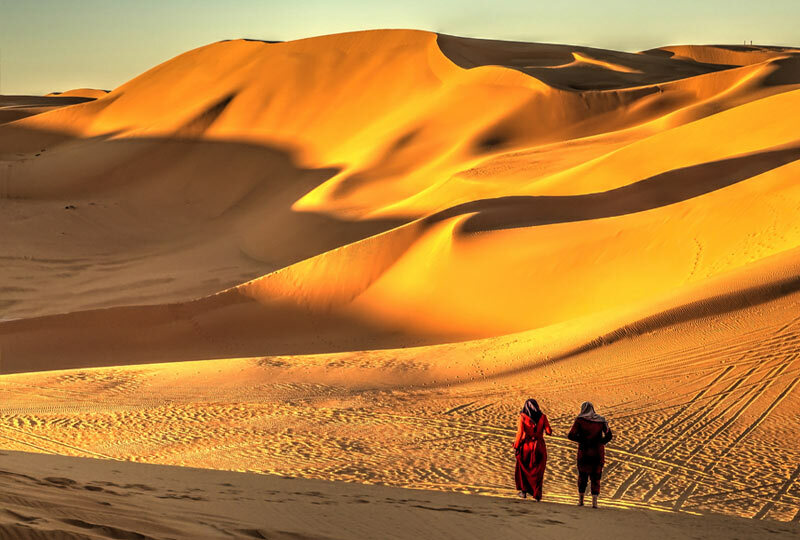 In the morning, enjoy a talk by Julian and then set out on an exploration of the city and surrounds of Timimoun, an oasis town in the midst of the endless dunes of the Sahara Desert. Strike out into the Grand Erg Occidental, the ‘Western Sand Sea’, in 4WDs, crossing great sand dunes up to 120 metres tall which flow, like giant, slow, wind-blown waves, across the desert at a rate of up to 30 metres per year. See palmeries cultivated as vital sources of shade, food and building materials, and discover the secrets of the system of foggaras (water channels) by which human settlements are irrigated. See the evocative sebka (salt lake), and the remains of the Ksar of Ighzer, a recently-excavated desert fortress. Enjoy lunch at a traditional Bedouin village, experiencing the hospitality for which the people of the desert are legendary. 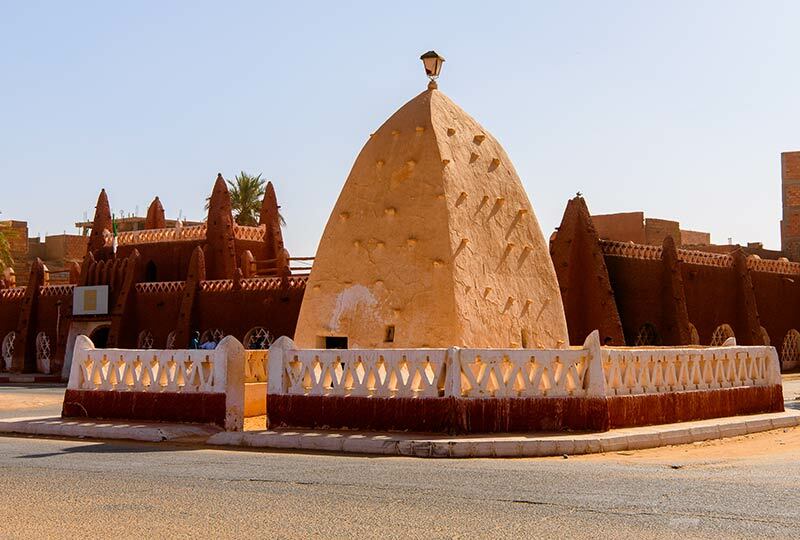 Then return to Timimoun itself to explore this enchanting red mudbrick town in the midst of the desert, an oasis nourished by a vital spring of water. See the Ksar of Timimoun, the imposing ochre-red Gate of Sudan, the mosque and the covered market. In the late morning, check out of the hotel and transfer to Timimoun Airport for a flight to Ghardaïa via Algiers (flight included in tour price). On arrival in Ghardaïa, transfer to the hotel for check-in (transfer included in tour price), arriving in the late evening. There will be a light dinner available on arrival at the hotel. Begin the day with a morning talk by Julian, followed by an orientation walking tour of Ghardaïa, one of a collection of towns situated in the M’Zab Valley. 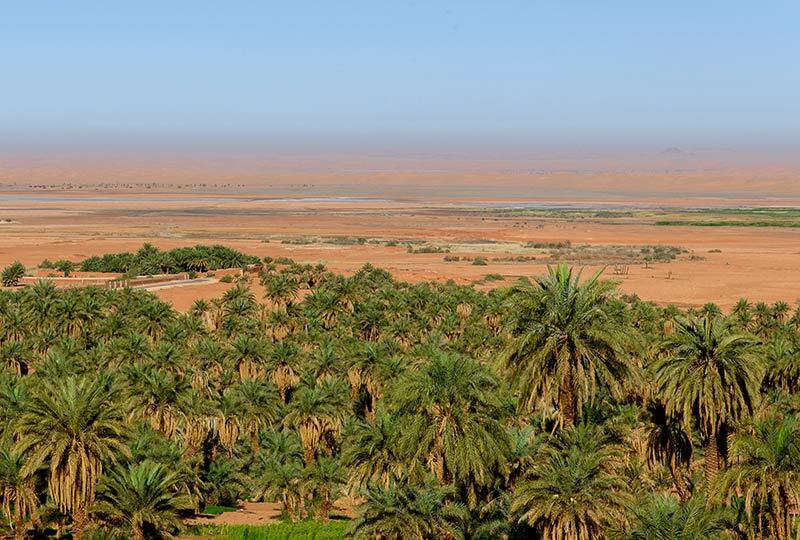 The M’Zab Valley was entered on the UNESCO World Heritage List as the homeland of Mozabite Berber culture, a distinctive desert culture which follows the ‘quietist’ Ibadi sect of Islam (separate from the more ‘activist’ global Sunni and Shia traditions). 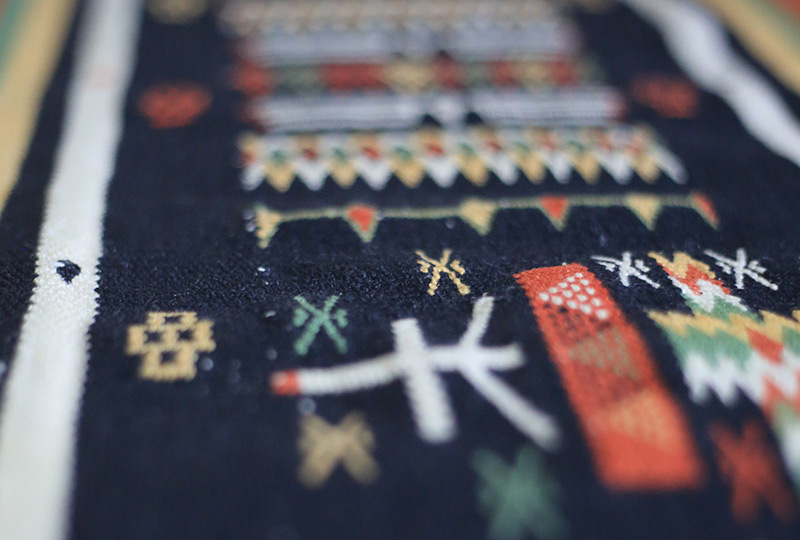 The Mozabites, like their Berber kinsmen in the north of the country, also have strong traditions of craft and tapestry. 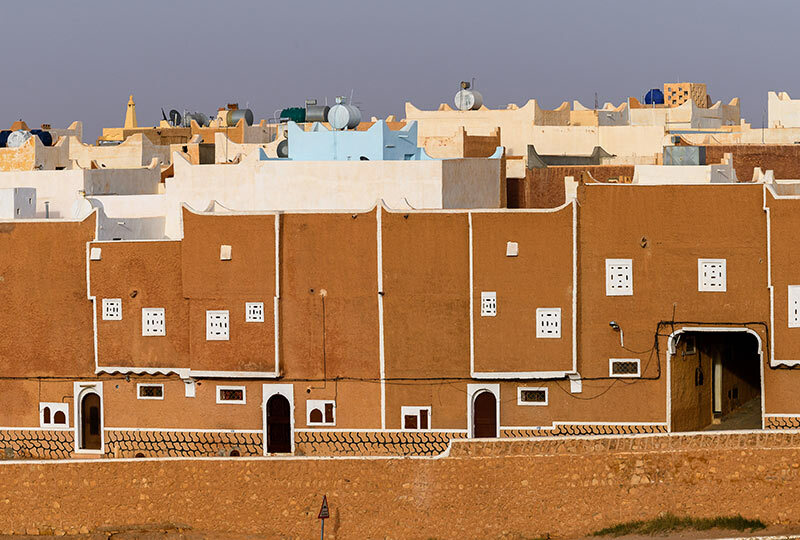 In Ghardaïa, explore the pyramid-shaped Mosque of Ghardaïa and the orthogonal clay houses of pink, white and red which inspired French philosopher Simone de Beauvoir to liken the town to “un tableau cubiste magnifiquement construit” (“a magnificently constructed Cubist painting”). After lunch at a local restaurant, visit nearby Mélika, another of the towns of the M’Zab Valley, which is home to the evocative white clay turrets of the Tomb of Sidi Aissa. Then visit the town of Béni Isguen, the name of which means ‘The Son of Those Who Keep the Faith’ in the local Berber language. Béni Isguen is regarded as a sacred city, with visitors only allowed to visit designated sectors at certain times, and historically the inhabitants of Béni Isguen sought to maintain their purity by rarely venturing beyond the limits of their own oasis. Its isolation has allowed Béni Isguen to preserve strong Mozabite traditions of pottery, brassware and jewellery. Return to Ghardaïa in the late afternoon. Dinner this evening is at a local restaurant. Enjoy a morning at leisure to relax in the gentle climate of a Saharan oasis. In the afternoon, transfer to Ghardaïa Airport for a flight to Algiers (flight included in tour price). Arrive in Algiers in the late afternoon and transfer to the hotel. This evening, enjoy a special farewell dinner with Julian and fellow travellers. Check out of the hotel in the morning and transfer to Algiers Airport (transfer included in tour price). Tour arrangements conclude on arrival at the airport in time for suggested flights to Australia or New Zealand on Qatar Airways via Doha, departing from 15:00. Renaissance Tours or your travel agent can assist you with your flights and other travel arrangements, including any additional nights’ accommodation, either before or after the tour. Australian and New Zealand passport holders require a visa to visit Algeria. The visa will be obtained by Renaissance Tours and is included in the tour price. ** Please note: This tour is designed to connect with Tunisia – Berbers, Carthaginians and Romans tour – from 21 October – 3 November 2019 with archaeologist Iain Shearer. Please contact Renaissance Tours if you are interested in combining these tours into one grand archaeological adventure of North Africa! N.B. Hotels of a similar standard may be substituted.